Things have only gotten worse for Noah at school. There was the glue incident. (A scuffle over a bottle of glue left another boy with his face covered in glue and Noah holding the bottle. Interpretations of how the boys got into this tableau vary). There was the cutting in line incident. (Noah maintains the girl cut in front of him and he was merely reclaiming his spot, but only he was punished.) And so on. He’s so deep in dutch with Senora A that he has to sit out free-choice play frequently and he’s a regular at the school disciplinarian’s office. More disturbing are the things he’s been saying about school. While he and I walked through the college campus on our way home from drama one afternoon shortly before spring break he saw a sign for a job fair and wanted to know what it was. I explained and he said he wished he could go to the fair and get a job and not have to go to school any more. I told him three quarters of a year of kindergarten was not enough schooling to become a meteorologist (his current career goal) and he conceded he’d have to keep going. Then one night when Beth was giving Noah a bath, his rubber duck told her, “Most of the things Noah does at school are wrong.” It breaks my heart he feels this way when he’s accomplished so much this year, learning to read among other things, and doing it all in a foreign language he’s quickly mastering. “It’s not Spring Break until Monday,” he said, ever the stickler for accuracy. Here are some snapshots of what happened over the course of spring break, starting with the weekend before it officially began. At the cherry blossoms Noah’s mood was all over the place. One minute he was grumbling that he didn’t like cherry blossoms and the next he was running gleefully up and down the path. We picnicked near a plaque that informed us that this particular cherry tree was donated by the class of 1972 of a Catholic school from New Jersey. Noah studied the date and decided the plaque was a time machine that would take us back to “the year one thousand nine hundred and seventy two” if he jumped on it. “How old were you then?” he asked. In April of that year, I was almost five and Beth was nearly five and a half, we told him. “How would you like to be young again?” he asked. “Go for it,” I said and he jumped. As we spun back through the years toward five, I gave Beth a lingering kiss. We must have gotten stuck for a moment at twenty. In the morning Noah had a real honest-to-God tantrum, the first one he’s had in a year and a half. He and Beth were playing computer games together and when she said it was time to stop, he seemed fine and began to walk away from the computer. Then without warning he was crying and waving his arms and hurling his body around the study, seemingly completely out of control. Beth remembered what to do, dropping to her knees to get on his level, putting her arms around him and speaking soothingly. Once he calmed down she asked him if was upset about anything, maybe something at school? He said no. Attracted by the noise, June kept crawling into the study and I kept retrieving her so Beth and Noah could talk. I wanted to leave the door open so I could eavesdrop but eventually I gave up and closed it. June stood outside the door balancing against it with her palms. When Beth and Noah emerged I asked her if she got anything out of him and she said no. That afternoon we had lunch at the Taste of Takoma festival a few blocks from the house. Noah was still grumpy and wouldn’t eat. Then Beth made the wondrous discovery that the moon bounce was free this year. I went home to clean house while Beth and June watched Noah jump for a full hour. They came home; he ate a big lunch and was happy the rest of the day. At 2:50 pm, June and I arrived at the Round House Theater’s spring break day camp. We’d signed Noah up for the camp before his school troubles intensified but Beth and I were both hoping that three six-hour days of make-believe followed by a short family getaway to Ocean City would be just the mix of fantasy and family time Noah needed. Still, I was a little nervous picking him up because he’s been so negative about everything recently. Noah’s friend Maxine was also attending the camp and I chatted with her mother as we waited for the kids to be released. When we were invited in, we found ourselves in a long rectangular room scattered with art supplies and full of kids running around collecting lunchboxes and backpacks. Maxine came over with her arms full of art projects to show her mother. Noah had just a paper bag painted black, with small white paper cups glued to it for eyes. A cat, he told me. Every day at camp they went somewhere and today it was Music Land, he said. They’d made costumes and instruments and played in a band. It sounded too good to be true. Dress-up and music are among Noah’s passions. His group all dressed as animals. “I wish you could see my cheetah costume,” he told me wistfully, but somehow, he’d lost it. We looked around for it unsuccessfully. I asked if he had an instrument to bring home like some of the other children. No, he’d spent so much time on the missing costume he never got around to making the instrument. All this sounded pretty familiar. Noah misses free-choice play working on half-finished school projects about as often as he’s forced to sit it out for behavior. But he seemed pretty happy and not to mind, presumably since no one had made an issue of his not finishing. After camp we went out for ice cream and to play on the Astroturf. (In downtown Silver Spring, there is a vacant lot the city covered in Astroturf to create a temporary green space where a skating rink is to be built. The turf attracts a real social cross-section– teenagers, singles, families of all income levels and races, anyone who wants to sit outside, which as it turns out is almost everyone. Due to overwhelming popular support for the turf, the skating rink may be scrapped and the turf made permanent. Here’s hoping.) I meant this to be a treat, but as it turns out, the turf is a two-adult activity, one to sit with June and one to tear around with Noah. He didn’t want to run around by himself, so we headed home. Mulling his day over, he decided that he didn’t like the cheetah costume he’d wanted me to see so badly because “it wasn’t very successful.” This is something Noah does frequently these days, revising his first report of events, always in a more pessimistic light. I wondered what his final assessment of drama camp would be. I needn’t have worried. When I picked him up the next day he said, “I’m sad tomorrow is my last day.” Maxine had even more numerous and complex art projects than the day before. Noah had a single tissue paper flower on a ribbon, but he was happy and excited to tell me they had gone to Sports Land and attended the Olympics. Campers invented and demonstrated their own games. Noah made the tickets and Maxine made the concessions. The paper flowers were medals, Maxine told me. No, Noah said, they’re flowers. “Maybe medals that look like flowers?” I suggested. Maxine’s mother and the theater’s receptionist chimed in their agreement. “Hers is a medal, but mine is a flower,” Noah asserted. Maxine agreed. Everyone was satisfied. As we left I told Noah I had a surprise for him. April is Maryland Math Month and Noah had brought home a sheet of math games and activities, one of each day of the month. He wanted to do them all, but some required books we didn’t have. Beth told him we’d have to skip those, but I had made a trip to the library and to Borders and acquired all the books. Noah’s face was joyous when I told him. Today’s book was an I Spy book. For those of you unfamiliar with the I Spy series, every page is a photograph of a jumble of objects with a rhyming riddle directing you what to look for in the picture. The math sheet activity involved counting and sorting objects by attribute. We went to the café at Borders where I thought we could work at the tables. This turned out not to work since June was so antsy. “You have ants in your pants,” I told her. “Tiene hormigas en sus pantalones,” Noah chimed in and I laughed at the translation. We ended up moving into the children’s book area where June could crawl on the floor and play with a beanie baby display while Noah and I pored over the book, looking first for the objects in the rhymes, then for red circular objects. The day before Maxine’s mother had offered to drive Noah home the remaining two days but something made me turn her down. I wanted to make this after-camp time special for Noah and it seemed easier to do that away from home. Now I knew we were in exactly the right place. If we’d taken the book home we would have been distracted by something– television, computer games, laundry, cooking, whatever. As it was we were both totally present and focused on our task and each other. I put my arms around him as he pored over the book and nuzzled the top of his tousled hair. By the final day of drama camp, June had what child psychologists call situational awareness. She knew what was coming when we walked through the doors of the room and she began scanning it eagerly. The room was a visual treat– full of colorful objects and kids running around, but she only had eyes for Noah. Mystery Land was Noah’s final destination. Each group had a mystery to solve. His involved the disappearance of all the lights at the Round House Theater. It turns out a window-seller (who wanted to create demand for windows) was the culprit. Before we left, Noah went up to each counselor and said, “See you this summer!” We’d told him he was going to the spring break camp so he could decide if he’d like to attend the longer summer version. I guess he made up his mind. We made a quick trip to Whole Foods for a smoothie and while we sat at the counter we looked at the I Spy book some more, but Noah wanted to get home quickly to pack for our trip to the beach. On the bus home, I looked down and noticed that June and Noah were holding hands. It was mid-afternoon when we got to Ocean City. After inspecting our quarters, a deluxe suite with a balcony overlooking the ocean and a Jacuzzi tub (the kind of accommodations we could never afford in-season), Noah and I went down to the beach. We ran around in the surf in our boots until I saw Noah was getting pretty wet. We retreated up the beach and built a sand castle, which we decorated with shells and a beach grass flag. It was the castle of a weather wizard, Noah said. He took a short section of beach grass, which he identified as the wizard and another he said was the wizard’s nemesis, who wanted to steal his power to control the weather. The game proceeded without much need for input from me, other than my listening and asking the occasional question. I lay on my side alternately watching the rise and fall of the waves, and Noah’s play. 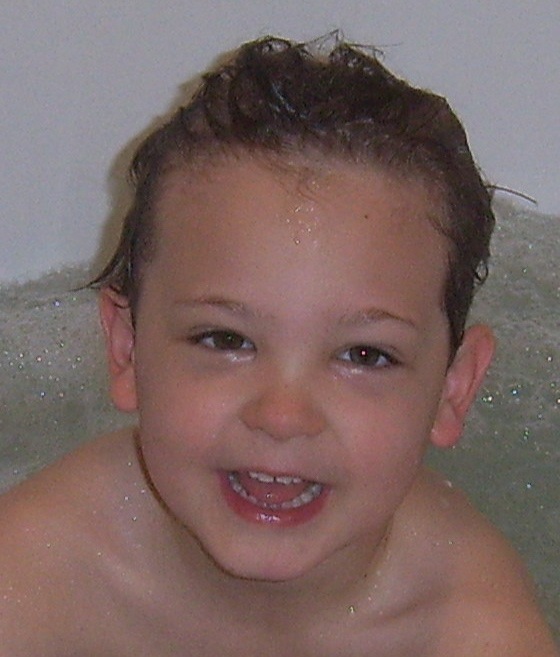 When it was time go up for dinner, we headed back to the room, where a cold and sandy Noah took a Jacuzzi bath. He said he did not like Jacuzzis, but he couldn’t suppress a grin when the bubbles came on. At the information center at Assateague Island National Seashore (http://www.nps.gov/asis/), Noah was back and forth about everything. He couldn’t decide whether or not he wanted to touch the horseshoe crab, whether or not he wanted anything from the gift shop, whether or not he wanted to do the Junior Ranger activity sheet. Finally he settled firmly into a bad mood, lying down on the floor and saying he didn’t want to go hike the trails, he wanted to go back to the motel. “Noah, get up right now,” Beth said firmly, and for a wonder he did. We hiked three short trails: forest, marsh and dunes. The whole time, Noah alternately grumbled and dashed ahead of us, seeming carefree and happy to be out of doors, asking me to read all the informational signs and pretending Hacker, the villain from PBS’s Cyberchase cartoon, had stolen the many missing signs and that he was on a mission to read all the remaining ones before they disappeared. We saw the famous ponies, but Noah didn’t seem all that interested. His reward for completing all three trails was the chance to ride his scooter down a paved trail near the beach. That night we had pizza at a restaurant on the boardwalk in Ocean City. As we left, Noah announced, “I have great news. 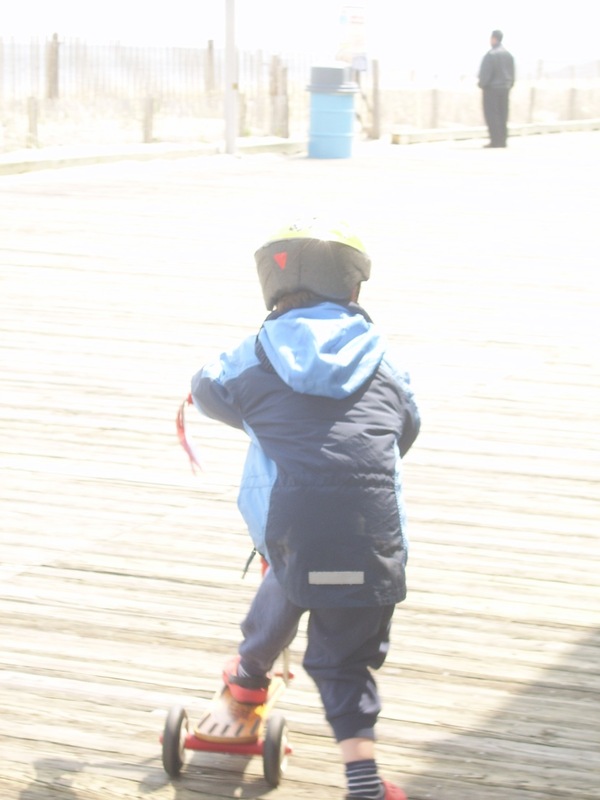 At 7:50 p.m. Noah Lovelady-Allen will be performing tricks on his scooter on the boardwalk.” And he did, zipping around, trying to make the little wooden scooter do a wheelie. After the performance, we took a walk down the boardwalk. It was cold, but the lights were bright and Noah zoomed ahead of us on the scooter, weaving around pedestrians, nearly crashing into many, hitting none. On the way home from the beach, we stopped at two lighthouses, one at Fenwick Island, Delaware (http://www.beach-net.com/lighthousefi.html) and one in Saint Michael’s, Maryland (http://www.cheslights.org/heritage/hoopers-str.htm). Noah has been in love with lighthouses since he was three and touring them and photographing him in front of them has become a hobby of ours. At the first lighthouse, which was closed to the public, Noah refused to be photographed. He’s been camera shy for the past year. (Disclosure: I bribed him with a deck of Old Maid cards for sale in the hotel lobby to get his consent for the Jacuzzi photo.) I decided not to push it. So at the second lighthouse, I was surprised when he agreed with only minimal coaxing to pose on the steps of the Chesapeake style lighthouse. Once inside, Noah delighted in exploring. 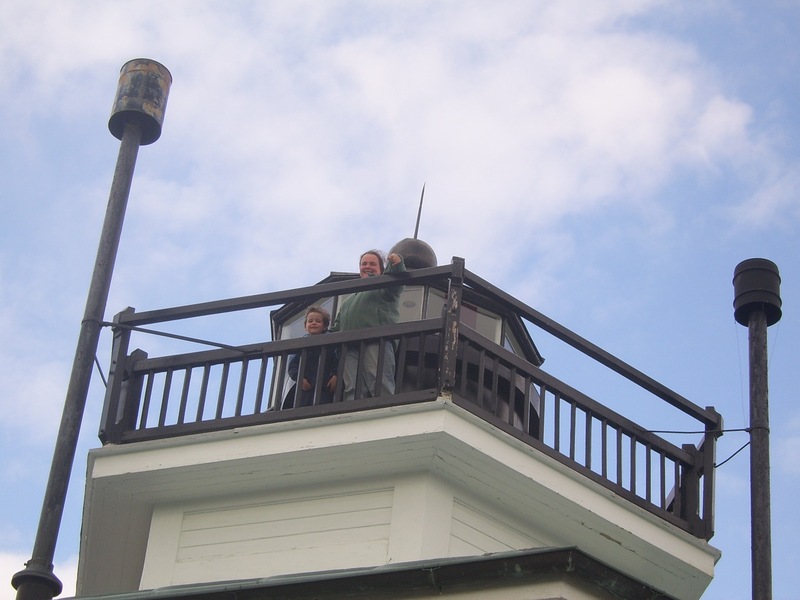 He was particularly interested in finding the ropes of the pulley-operated fog bell on each level of the lighthouse. He and I went up the narrow, winding stairs to the top while Beth stayed on the lowest level with June. When we came down, he insisted Beth go up and see the top, so I stayed downstairs with June while they went up. We thought we were finished when Noah insisted I go up one more time to go out on the walkway. I had not noticed the tiny doorway at the top level when he and I were up there, but he’d found it and opened it while he was up there with Beth. I hesitated because the grounds were about to close and I wanted to use the restrooms before they did. “Beth could take a picture of us up there,” Noah bargained. That did it. Up we went. 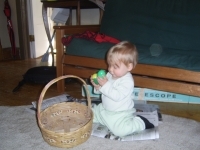 The night before Easter as I lay with Noah at bedtime he said, “I’m going to keep a lookout for that bunny!” Last year around Easter I got some very pointed questions about the Easter Bunny. Noah finally decided it was not a giant bunny at all but a man in a bunny costume. With this revision, he was able to swallow the story. I was sure it was his last Easter believing in the bunny and I doubted Santa Claus would make it until Christmas, but this year Noah actually seems to believe more easily than last. I wonder if he has a greater need of magic right now. The bunny came, unseen, and brought chocolate bunnies for each child and jelly beans for Noah. 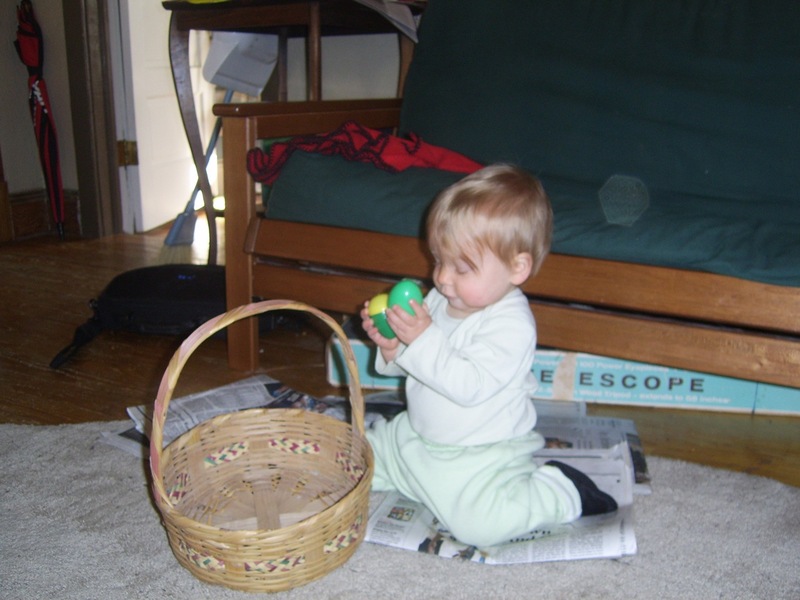 In the afternoon I hid plastic eggs on the front porch and the lawn for Noah (he was unwilling to get our real eggs messy) and then he hid them for me. Once we came inside, we scattered them on the living room rug for June to hunt. Easter Monday was the last day of spring break. Beth was back at work after a four-day weekend. I had a busy day planned—a trip to the pediatrician to get June’s one-year shots (she couldn’t have them at her one-year appointment because she was one day shy of her birthday), a trip to the library, laundry, etc. But June had a truly horrific night and as I lay in bed that morning feeling as if I hadn’t slept at all, I began scaling back. We’d go to the doctor, but everything else was negotiable. Noah had come into our room and was playing with June, touching different parts of her body gently and telling her their names. June watched with grave attention. Beth called from the dining room that Noah’s cereal was ready and he said, “Bye, Juney. I gotta go eat my breakfast.” Then he hopped off the bed, dropped into a starting position and said, “Ready, Set, Go!” and dashed off. We went to the pediatrician for June’s shots and out to lunch in the city. Then we came home, watched television and looked at the I Spy book. We did not go to the library; the laundry stayed unfolded. Instead of homemade broccoli, lemon and egg soup I boiled some rigatoni and made a salad. I wanted to take it easy because the next day spring break would be over and we’d be back to our routine. 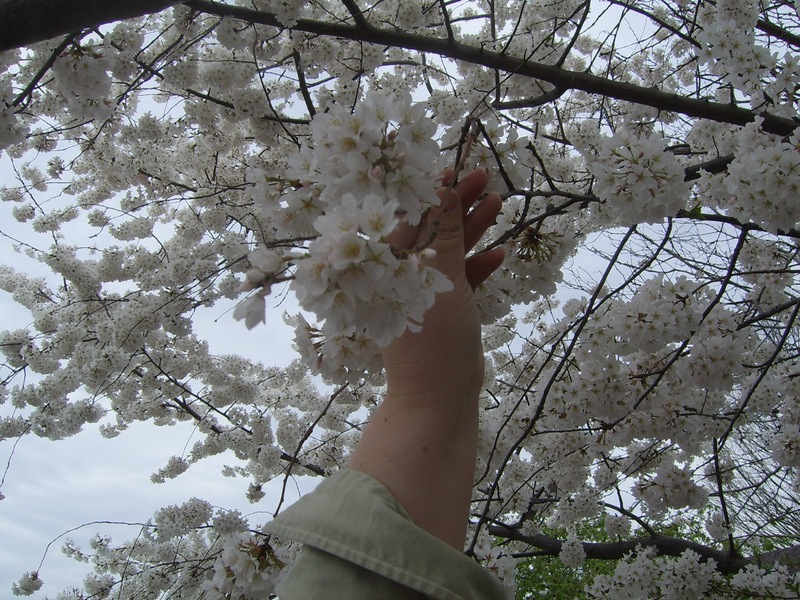 This entry was posted in Beach, Cherry Blossoms, Excursions, Extracurricular Activities, Literacy, School by Steph. Bookmark the permalink.